Whale sharks carry an identifier as unique as your fingerprint: a pattern of spots behind the gills on the left or right side. In theory, this makes visually identifying and counting the world’s largest fish simple. That’s exactly what Whaleshark.org aims to do to track and monitor the health of this threatened species. Eco-tourists have submitted tens of thousands of photos of the spots on whale sharks they encountered, and a computer algorithm matches the photos. Effective conservation needs detailed and accurate information about animal populations. However, just as fingerprints on your left hand aren’t identical to those on your right, it’s impossible to accurately match photos from the left and right sides of the same shark. This could mean skewing the results by counting the same shark twice, or not counting enough by only using the left views. 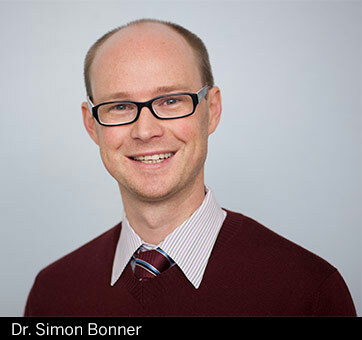 Fortunately, Whaleshark.org has Dr. Simon Bonner on its team of researchers. As Assistant Professor of Environmentrics at Western University in southwestern Ontario, he focuses on developing new statistical methods for analyzing complex ecological data. Bonner came up with a model that allows for data from both sides of the sharks to be included in the analysis while properly accounting for duplication. This has increased the precision of the estimated population growth rates by as much as 45 per cent. “People have the idea that statisticians are number crunchers,” Bonner says. “They think if we’re helping biologists, we’re just taking their data and putting it into a spreadsheet. At the other end of the scale, Bonner is personally interested in birds, not sharks. A bird watcher from his early teens, Bonner went to university looking for a way to combine his interests in both biology and mathematics. He ended up studying pure mathematics and fitting in biology courses where he could. One summer, he also helped banding and monitoring birds at the Long Point Bird Observatory. His lightbulb moment came in a probability and statistics module during third year, where he realized the power of statistics. After completing his BSc in mathematics, he went on to earn both a Masters and PhD in Statistics at Simon Fraser University. “My current joint position in biology and statistics allows me to find my own balance within the research I do,” Bonner says. Bonner’s primary area of research has focused on developing methods for analyzing data from mark-recapture studies. These methods are crucial for monitoring populations of wild animals that can’t easily be followed. The methods are used not only to estimate the size of the population but also to study changes over time and the effects of outside pressures, like habitat loss and climate change. Typical invasive studies capture and mark a portion of the animals before releasing them. Non-invasive studies include photo identification, as with the whale sharks, and collecting genetic samples, such as bear fur caught in a snare. Accurate mark-recapture information relies on correctly identifying individual animals every time they are encountered, but errors happen. Birds are commonly marked with small numbered leg bands that are easily misread. Fish are often marked by clipping their fins, which can be easily overlooked. Even genetic information is prone to error if samples are not fresh or contain too little DNA to get a positive ID. Bonner’s particular interest in studying wild animal populations is driven by concerns about the effects humans have on the natural environment. He hopes his research will be used by people monitoring wildlife numbers to understand those effects and how to maintain and manage animal populations. Current collaborations involve snakes and salamanders in Kentucky, cliff swallows in Nebraska and lizards on islands in the Spanish Mediterranean, as well as the whale sharks. Methods developed during Bonner’s Ph.D. have been applied by researchers from BC Hydro studying the effects of dams on salmon and by managers of the Trinity River Restoration Program in California. Since arriving at Western, he has started working with researchers in the Department of Biology using minuscule VHF transmitters to better understand migration patterns in warblers and other small birds. Bonner often supervises students doing similar research, from the undergrad level through Ph.D. candidates. 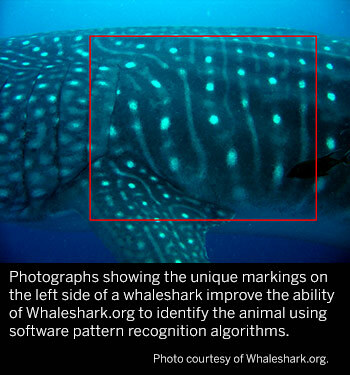 For example, Ph.D. student Amanda Ellis at the University of Kentucky is developing new methods to account for the level of similarity between pairs of photographs when analyzing data like that collected by Whaleshark.org. The work should remove the need to confirm computer matches by eye, a time-consuming process.